The emergence of happiness economics has resulted in the increased interest to use happiness as an indicator for national development and as a basis for formulating country policies. As such, governments of the United Kingdom, France, Germany, United Arab Emirates, and China have expressed interest in using national happiness as a prime goal for policy. The same is done by the United Nations General Assembly which encouraged countries to pursue measures to reflect the importance of pursuing happiness and well-being in development. Likewise, sustainable development has taken a major turn in the development sphere. This 2015, UN Member States will be adopting the Sustainable Development Goals (SDGs) which will expand and continue the efforts started in the Millennium Development goals set to expire in the same year. The SDGs, which contain 17 goals and 100 indicators, aim to achieve multidimensional development in various areas such as dignity, people, planet, partnership, justice, and prosperity for present and future generations. A key improvement in the SDGs is the inclusion of measures of evaluative well-being as one of the indicators to capture a reflective assessment of an individual’s overall satisfaction with life. One of the hindrances in achieving sustainable development and increasing happiness levels of citizens is the limited resources of governments. Likewise, there is also an emerging need to determine if sustainable development goals on economic growth, social inclusion, and environmental sustainability really reflect the well-being and happiness of citizens of countries. However, the challenge still prevails on how countries can maximize resources to achieve greater happiness and at the same time achieve sustainable development for present and future generations. 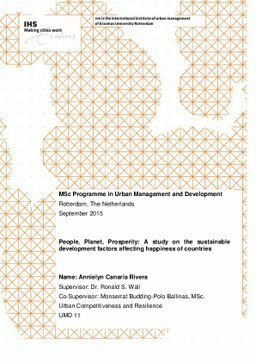 The objectives of this research, therefore, is to explore the sustainable development factors, focusing on people, planet, and prosperity indicators and how these factors relate to happiness levels of countries. The research also studied how sustainable development indicators affect the happiness of different income groups and regional clusters as there are more similarities in terms of happiness and development levels across these groups. This becomes even more important as the determinants of happiness for one income group or region is not the same for all income groups or regions. Thesis Advisor Wall, R.S., Budding-Polo Ballinas, M.